StrongVPN is one of the oldest VPN service providers currently on the market. It was established in 1995 as an internet services provider in USA. The company has strong reputation for excellence support and a wide variety of servers located in more than 19 countries. It provides OpenVPN, PPTZ and L2TP security protocols which are backed up by technical experience and innovation in VPN services to allow anonymous browsing. StrongVPN makes security its number one priority by ensuring the customers’ information stays secure. The company is equipped with the latest technology and strong track records for its clients. All the information on the system is highly encrypted and ensures that the data of customers can never be compromised by hackers. StrongVPN offers both dynamic and static IPs on PPTP and OpenVPN servers respectively. Its bandwidth is unlimited and allows communications of pee-to-peer. It also gives access to over 1370 servers in 20 countries with USA having the highest number of servers. StrongVPN offers unmatched speed and reliability when compared to other conventional VPN service providers. StrongVPN has many servers in different locations worldwide. It has 1370 servers spread a cross 20 countries with the majority located in San Francisco, California and over 10,000 IPs. It has a system that works efficiently and effectively from multi-home BPG4 system connected to 30 networks. StrongVPN is represented in major cities and countries like UK, Canada, USA, Germany, Czech Republic, Singapore, Netherlands, china, Italy, Malaysia, Romania, Russia, Sweden, Norway, France, Hong Kong and Japan among others. 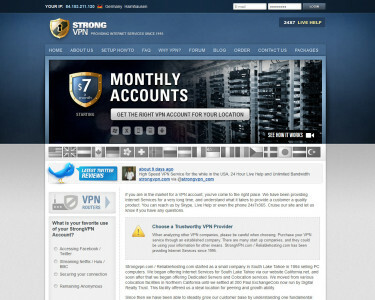 StrongVPN subscription packages have 7 days free trial and a 7 day money back guarantee to all its clients. It has the capacity to support most commonly used software and hardware devices and programmes. The company focuses on customer-friendly policies as well as offering them with an excellent customer care support. StrongVPN does not collect or save any log files on customers usages and it state clearly on terms and conditions that, the company keeps log files for strictly one month.